Sunnyside Lodge01263 715779work01603 870304fax Self-cateringSunnyside Lodge is the perfect base for a family or friends party. 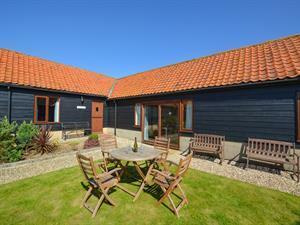 Enjoy peaceful surroundings with views out over the gorgeous Norfolk Countryside. Situated with two other lodges, Sunset Lodge and Sunrise Lodge, these properties can be booked together for larger parties who want to holiday together but retain their own space. • Utilities: Electric oven and hob, microwave, dishwasher, washing machine and fridge/freezer. • Other: Towels. Travel Cot and Highchair available on request. CD Stereo and Radio. Sunnyside Lodge is the perfect base for a family or friends party. Enjoy peaceful surroundings with views out over the gorgeous Norfolk Countryside. Situated with two other lodges, Sunset Lodge and Sunrise Lodge, these properties can be booked together for larger parties who want to holiday together but retain their own space.